Luckily on Saturday morning I woke feeling fairly good. I can only attribute it to the 2 doses of Flexeril and the Melatonin combination. Hubby decided that shopping in the market didn’t sound so bad, so he joined me on our walk to the market floor. I have no idea how to express to you in words the amount of people already in the market. I knew it was going to be busy, but I suppose I’m never quite prepared for large crowds. I knew that my Ravelry passport had very few stamps/stickers in it, so today I planned on collecting them all, as well as making sure I picked up some yarn from WEBS for a sweater or two. 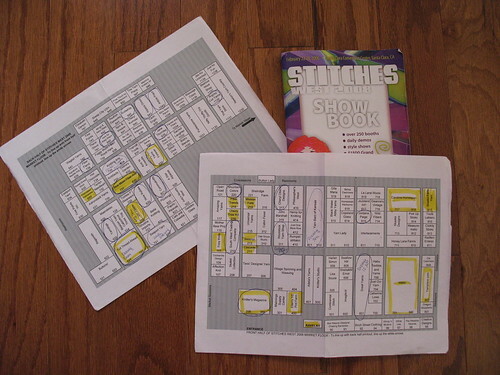 Since I’d walked around all the booths the day before to see my options for purchases, I took my market floor booth layout sheet, and circled all the booths I needed to stop at and for what item. Some were just for the Passport, some were to enter drawings, and others were for purchases. This definitely helped keep me on track and I will do it every year that I attend Stitches. The current sweater I’m knitting, the Radiance Cabled Jacket, has a hook and eye closure instead of buttons. On Friday I’d noticed some beautiful Norwegian pewter hook & eye clasps at AffectionKnit, so I stopped at their booth first. 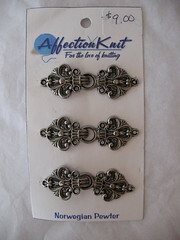 I surveyed all their pewter clasps, and all the sets of 3 were $14, but I got this one for $9, so I felt like I’d found a bargain. The booth was already extremely crowded, and several rude women pushed their way ahead of me in line so I ended up standing there for 15 minutes waiting to make my cash purchase. In fact, I think these women must have been around me all day because the level of rude people at Stitches was at an all-time high this year. I didn’t make another purchase for quite awhile since I was gathering Passport stickers/stamps and entering my name into daily drawings for this and that, but when I stopped at the Fibersphere booth to get my Passport stamped, I noticed some bags (of course), As I was looking over the sock size bag, the vendor shared with me the story behind the bag. Since I’m a sucker anyway for any type of bag, when I found out that women in Cambodia were making them and were being paid three times as much as they’d normally make so they could support their families, I just had to support the cause. I’m not sure what the material is on the outside of the bag (bamboo?) 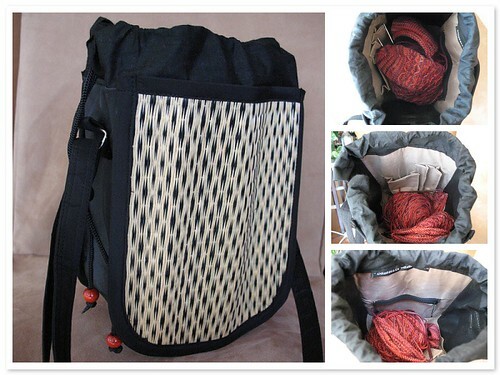 but the inside of the bag is fabric lined with two open pockets, one zippered pocket, and the strap is adjustable. We walked around for awhile, collecting stamps, and entering drawings, but when we ran into Cindi, Barbara and Rhonda at lunch time, we decided to pass on the $10 hotel sandwich and drove to Baja Fresh for a quick and inexpensive lunch. Of course we weren’t there long since there were schedules to be kept by the others in our group, so I returned to the market to continue filling up my Passport. 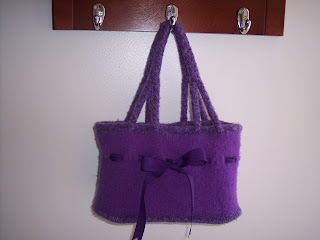 The next Ravelry passport stop was Article Pract. 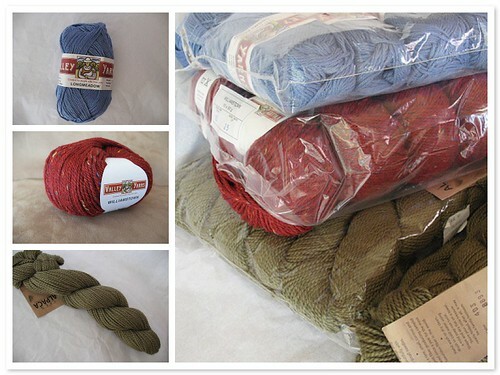 As I walked in to get my stamp, I noticed the Malabrigo worsted with a sign saying $10/skein. Then I noticed the Julie Weisenberger patterns. Next thing I know, I’m walking out of their booth just having purchased the Katarina pattern, the Malabrigo Loafers pattern, as well as 3 skeins of Malabrigo worsted in Forest and Azul Profundo. I had meandered around the WEBS booth on Friday looking at the huge assortment of yarns and trying to decide what I wanted for which project. I was so overwhelmed though, and so tired from that day I opted to wait and purchase on Saturday. Well here it was Saturday and as I started to wander a bit, a lovely young woman named Cirilia asked if she could help me. Realizing that I got nowhere Friday trying to help myself, I said yes. Boy am I glad I did. I showed her my printed Ravelry queue page and asked her for recommendations for the projects I wanted to knit. She was so nice, quick, and knowledgeable, that before I knew it, I had 3 sweaters worth of yarn in my husbands hands. I had intended on only buying one or two sweaters worth of yarn, but since I chose Valley Yarns for 2 of the sweaters, I was able to afford the 100% Alpaca yarn. 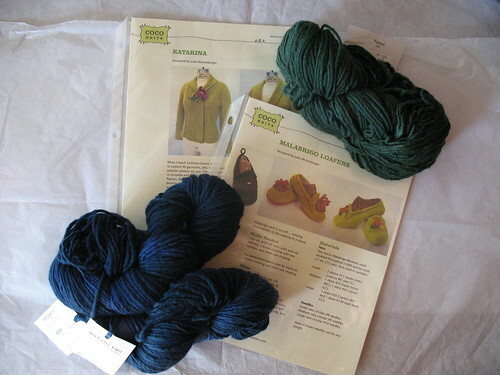 The blue yarn is Valley Yarns Longmeadow and I’m intending on using it for Drops Design 100-34, although I could use it for a few of the projects in my queue. The red yarn is Valley Yarns Williamstown and it’s intended for Katarina by Julie Weisenberger. The olive green yarn Blue Sky Alpacas 100% Alpaca and is intended for Henley Perfected. I can’t wait to start on these projects. At this point I could tell that my husband was at his shopping limit and so we decided to head back to the room to rest for awhile before dinner. That plan didn’t last long though. The market floor called to me from inside my room, so I left hubby to watch a movie while I wandered the booths for awhile. I wasn’t planning on purchasing anything, but when I saw this little book, I couldn’t resist. This softbound book is called Knitspiration by Fiona Ellis which is a knitting journal. I have long been in search of a small notebook that had both lined and graph pages in it so I could play around with some ideas that float around in my head occasionally. This knitting journal has everything I’d ever want in a journal, with inspiring words and Fiona Ellis even signed it. Dinner was a driving mis-adventure (no thanks to OnStar) to B.J.’s Brewery to meet-up with Lain, her husband and her son. Lain and I originally connected because of knitting, and although she knits beautifully, she is actually a scrapbooking designer, instructor, and podcaster. For what the Yarn Harlot is to the knitting world, Lain (ScrapHappy) is to the scrapbooking world. Someday I’ll say “I knew her when”. After dinner I met up with the group from the previous evening for more knitting until 1am, although hubby did not join us this night. When I booked our hotel room, I’d debated on whether to stay Saturday night and at that moment I was so glad I booked us through Sunday morning. Spending time knitting with others that enjoy the same things as I was a priceless moment. I knew that although the classes, and shopping were great, spending time with current friends, meeting new ones, and spending time with those who share the same passion, was the true gift of Stitches.